Interest in activating the immune system to control tumors dates to more than 100 yr ago and is often attributed to William B. Coley who used the inflammatory response to bacterial products as a form of immunotherapy (1). This initiated the era of attempts to nonspecifically activate the immune system with the hope that tumors would be targeted as part of the overall, predominantly inflammatory, response. Following the abandonment of the crude bacterial products in Coley’ s toxin, other bacteria or their cell wall products such as bacille Calmette-Guérin (BCG), Corynebacterium parvum, nocardia rubra, OK-432, and others have been tested. In some circumstances, these inflammatory activators have had success as antitumor agents. For example, BCG has activity in superficial bladder cancer in situ (2). Later, cytokines such as interleukin (IL)-2 that could activate T and natural killer (NK) cells were extensively tested and demonstrated activity in renal cell carcinoma and melanoma. In the past two decades, a new era in cancer immunotherapy has opened with the discovery of how the immune system can recognize and destroy tumors. 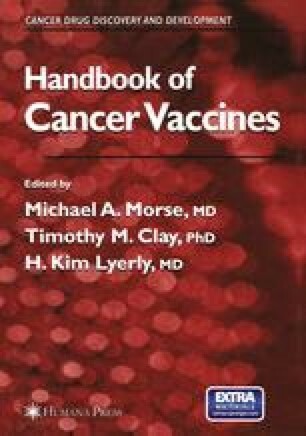 This has included the description of tumor-expressed antigens that can be recognized by immune effectors and a characterization of how immune effectors are primed to recognize these antigens as a signal to destroy the associated tumor. By harnessing these observations, it has been possible to design vaccines with the necessary ingredients for activating tumor antigen-specific immune responses in vivo.